Peaches Kitchen started out as dream of a little girl in Jamaica more than 30 years ago. Peaches Watson, started her professional career in the U.S. when she immigrated to Washington, D.C. in hopes for a better life. Peaches developed a name for herself when she became a personal chef for an upper class family. Eventually, she was able to branch off on her own and open her catering business with her son. They enjoyed much success in their neighborhood, but Peaches dreamed of touching more people. 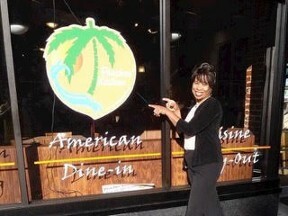 In February of 2007, Peaches opened Peaches Kitchen Restaurant in Northwest, D.C.
Peaches is a licensed caterer and experienced business owner. Her catering clients include DC council members, Non-profit organizations, and many happy families and individuals. Peaches strives to make sure every customers experience is a pleasant one. No wonder our customers keep coming back! Peaches is appreciative of all her customers and hopes that every impression made is a lasting and positive one. Come visit our restaurant and experience the spice! Or call to reserve your catering order or event today!